Stagecoach have been remarkably quick and able to muster staff and buses from around the empire to ease the problems, and deserve full credit for their efforts. What alternative arrangements will be in place? We are providing an additional 33 vehicles operating as park and ride services from Halbeath P&R and Ferrytoll P&R - this provides around 11,000 extra seats per day with buses operating up to every 10 minutes at peak times. Please allow extra time for your journey however with certain bus priority measures in place on the A985, your journey should be quicker than taking the car. Express City Connect Services in Fife will continue to operate to their normal routes until Halbeath P&R, Ferrytoll P&R or Dunfermline bus station (depending on where the route would normally reach first on the way to Edinburgh.) Customers will then be transferred onto dedicated services running to and from Edinburgh via the Kincardine Bridge and Ratho, then travelling to Barnton serving all normal stops from Drum Brae onwards, into Edinburgh. 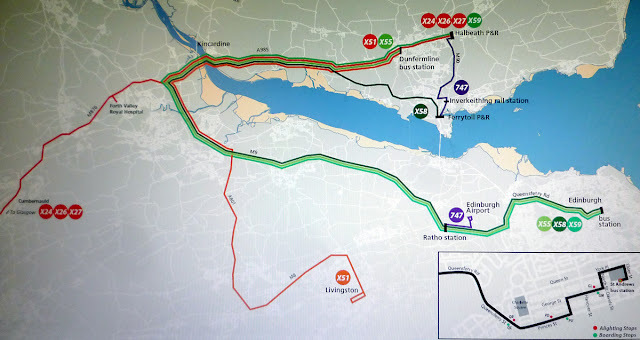 These routes represent all journeys heading towards Edinburgh from Halbeath P&R / Ferrytoll P&R / Dunfermline bus station and will operate as direct a route as possible. For those intending to use the train to reach Edinburgh, route 747 will provide a regular link between Halbeath P&R and Inverkeithing rail station, and Ferrytoll P&R and Inverkeithing rail station, therefore providing additional parking capacity for people using rail services. Local services will continue to provide bus links to Inverkeithing rail station as per their normal timetables, but all services will be using the stop for the rail station on Chapel Street, Inverkeithing (as not all vehicle types can use the turning circle at the rail station). The journey between Inverkeithing Rail Station and Ferrytoll P&R will be free to all users on Stagecoach services. Who knows, maybe some good will come of this difficult situation and convert car drivers to use public transport instead in the future. One of the routes concerned is the X58 which on the 7th was operated by a Megabus coach assigned to one of the Stagecoach in Chesterfield drivers. Once again the Stagecoach depot in Carlisle has suffered from serious flooding. Many areas of Carlisle are affected by the floods and as a result the Stagecoach website gives the following information about their services and the severe nature of the damage and disruption. "Due to severe flooding across Cumbria and North Lancashire there will be continued disruption to bus services on Tuesday 8th December. Below is an outline of what will be running. Please be advised that this is subject to a review and could change. Due to severe flooding in Carlisle over the weekend all town services continue to suffer significant disruption. Our depot at Willowholme has experienced major flooding and therefore access to certain areas of the city remains impassable. We are looking to run city services to all areas of Carlisle but diversions in place will mean that we will not be able to stick to scheduled timetables..
Out of town services will not be able to serve many city centre stops please catch your bus at the bus station. Service 79/179 will run normal timetable but will use the M6 between Carlisle and Kingstown Roundabout and then back onto the A7. Service 79 is being diverted via the A75 and will not serve Cummertrees. Delays are expected so please allow extra time for your journey. Service 80 will run as normal. Service 400 normal timetable but diverted within the city. 685 will now run between Carlisle and Hexham but will run to Brampton via the M6 and the A689 Airport Road. It will not serve Warwick Road, Scotby Road End or Warwick Bridge. Services 71 and 93 will not run. There will be no city services before 6am and we will finish running on these services at 7pm. There will be no cross city services. 61 City to Harraby East will run normal route with delays. 67 City to Upperby will run normal route with delays. 76 City to Durranhill will operate via London Road and Eastern Way with delays. 69 Holme Head to Eden Town will not run. To the north of the city one service will cover St Anns Hill, Lowry Hill, Kingstown ASDA, Kingstown Road and the entrance to Kingmoor Park. 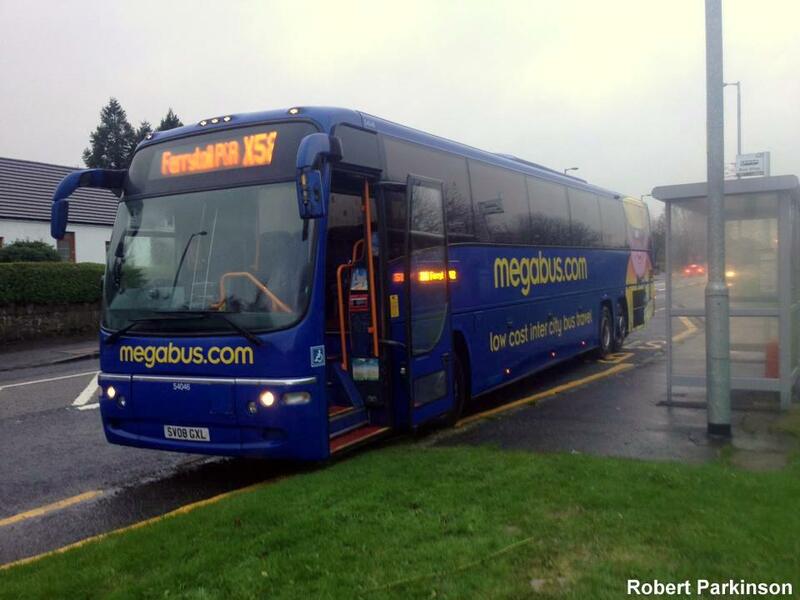 Buses will stop at all stops to pick up passengers and use the M6 to get back to the city centre. Sandsfield Park, Raffles, Belle Vue and the Hospital will all be served by one route with extended journey times. All usual stops in these places will see a service. Morton Park and Morton West will be served by one route with extended journey times all usual stops will be served. Please be patient, we aim to have services up and running as soon as possible. All city services will depart from Devonshire Street and Carlisle Bus Station until further notice. All school services across Cumbria and North Lancashire will run if the school is open. All services will run with the following exceptions. The A591 between Grasmere and Thirlmere has been partially washed away. 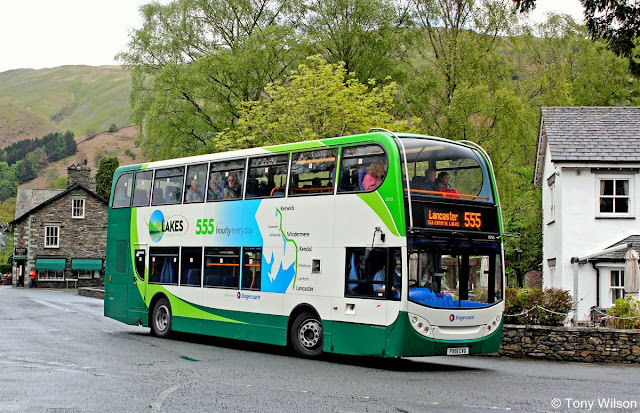 Service 555 will now run between Grasmere and Lancaster and we will have a shuttle service between Kendal and Penrith Railway Station via the M6 to make connections onto the next available X4/X5 service to Keswick. This will depart at 10 minutes past the hour. Service 505 and Service 516 will be assessed first thing Tuesday 8th. We intend to run these services but we need to evaluate in the morning. Service 552 will run but it will not serve Hincaster, Sedwick or Natland. It will run the same route as the 551. Kendal College services 502 and 506 will run but 502 may have to be diverted from normal route between Sedbergh and Kendal. The 78 and 508 services will not run. All services will run as normal except. Service X4 and X5 will run running between Workington and Penrith. For services towards Penrith and Workington, the route into Cockermouth will go via Low Road and Gallowbarrow. In to Keswick the route will run off the A66 onto Penrith Road. Until we are able to access Keswick Bus Station, this service will pick up along the A5271 Penrith Road. Service 300 is running through to Carlisle but will divert via Dalston Road when it reaches Carlisle. Service 600 will run as normal. The Greyhound and Skerton bridges are both now open so our services can now get into and out of Lancaster. 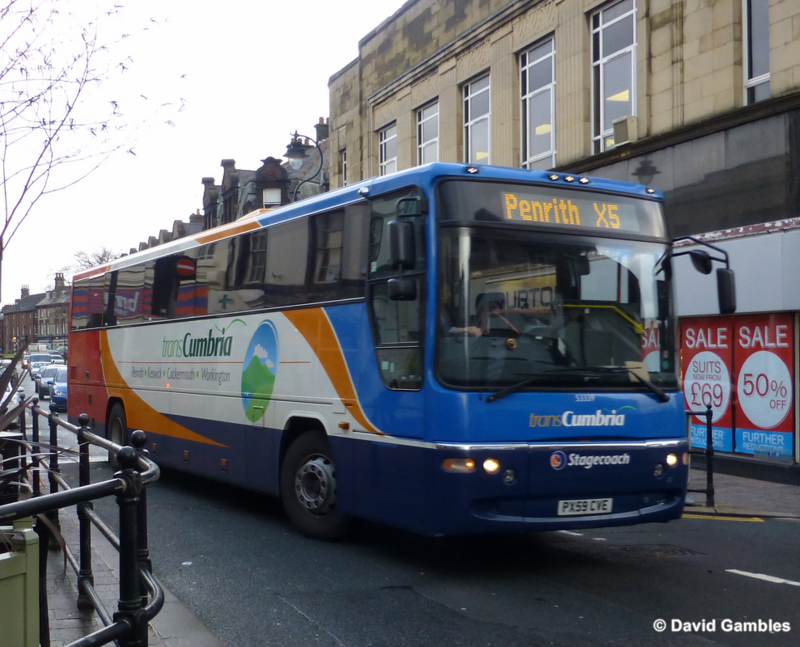 We still cannot access Lancaster Bus Station so services will call at Dalton Square and Common Garden Street instead. Otherwise most services will run as normal. Our team will be on hand to direct you to the right stop. All schools school services will operate if the school is open. Service 40/41 is running between Common Garden Street and Preston Bus Station. All journeys will call at The University in both directions. Service 42 is running between Common Garden Street and Catterall and then via M55 to Kirkham and then normal route from Windy Harbour. We will assess the normal route early tomorrow to see if we can resume this. Service 81A will not be operating via Gressingham Bridge."